The feels! Oh the feels! "The first thing you learn on the lion tamer team is to stay out of the path of the urine." This has turned out to be one of those real indie gems that are such a joy to discover. To start with, the editing and grammar are pristine. I didn't notice a single typo. It has obviously been professionally edited. 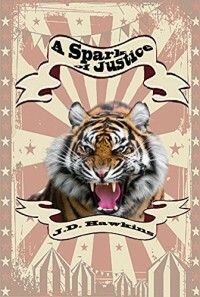 The characters include some circus people who are bound to be interesting, but the main character had layers of background and personality that are one of the real strengths of the book. John Nieves, actually Juan Nieves, is an insurance investigator who used to be a New York cop. He's half Hispanic and that brings up issues from his past. He's divorced, has a son, and has a phobia about clowns. Perfect for investigating the death of a lion tamer at a circus! Secondary characters include the big cats, who face an uncertain future. The circus is small and can't afford upkeep on the animals. While the death appears to be an accident, the secret dealings of the circus people and a few attempts on John's life make him suspicious of foul play, which he's determined to get to the bottom of regardless of the danger. This book made me literally laugh out loud several times, made me tense up, made me have all sorts of strong feelings. I got completely wrapped up in the fate of the big cats and with the life of the main character and what it's like to be an outsider looking into a closed community like the circus. The author seems to know his stuff too. According to his Amazon profile, he worked with a carnival so he knows the difference between the circus and the carnival, including some of the lingo which comes out in the book in a way that lets the reader learn the terms as they come up. This will appeal to Mystery readers who don't want a lot of explicit gore. What violence there is stays within PG parameters and the messy death of the lion tamer is only implied, having happened before the start of the story. It will also appeal to anyone who likes a circus story or anything with scary clowns, but again, not in the realms of extreme terror. It's an amusing read and is something I will probably read again. I'll also be looking out for anything else by this author.